City-dwellers threaten to get out of town most weekends, but never seem to follow through. Really, though, there’s no reason not to pack a bag and start the car when the Catskills exist. You already know that it’s beautiful and that it’s just outside Manhattan, but now we’re giving you some extra incentives to go there. Here are all the best off-the-beaten-path (or not even on the ground!) Catskills attractions. 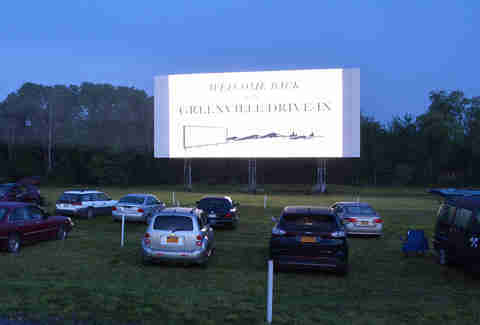 Drive-in theaters are an endangered species, like those cool Greek coffee cups or cheap studio apartments. Luckily for us, the Greenville Drive-In has been standing strong since 1959, and still shows retro and independent films (like the upcoming Grease sing-a-longs Aug. 31-Sept 3 and Rebel Without a Cause). The perks include $6 tickets, the fact you’re allowed to bring your dog in with you, and the attached biergarten. Afterwards you can get a malt and go dance the sock-hop, just to complete your ‘50s throwback. If getting down like it’s the 1950s all over again is your thing, stop by the roller rink in Purling, where $8 will get you rental skates and a night of Catskills fun. They’ve been open since the ‘40s, and keep tradition alive by renting out side-by-side skates and hosting classic roller rink events like limbo and dance contests. Plan a visit and recall a time when roller skating was supposedly corrupting the youth of America. The Hunter Mountain ziplines offer the longest canopy zipline in the US, sending you racing down the mountain for 650 feet. Now you, too, can explore the Catskills the way the pioneers did -- 60 feet above the ground. If that option doesn't scare you enough, you can opt to do your ziplining and rappelling at night, too. Ok, so Sunny Hill is an awesome, all-inclusive resort where you can relax in a lodge, go to the spa, or just enjoy the Catskills vibe. The real perk, however, is their Viking Obstacle Course, a 5.5-mile long course in the same vein as whatever mud run you’re used to. Unlike those courses, though, this one gives away $1,000 to the winners of the “Elite” course. Crushing that should be easy, as long as you can handle 10 foot walls and something they describe as “Arnie’s Armbusters." Good luck? Did you know they farmed elk in the Catskills? Did you know that elk are farmed at all? If you want to meet one of these things up close, just take a tour of the Armstrong Elk Farm in Cornwallville. As an added bonus, you can spend a night at the farm’s guest cabin, surrounded by endless acres of Catskills nature. Alpacas! Like sheep, but way more adorable. Really, though: look at them. 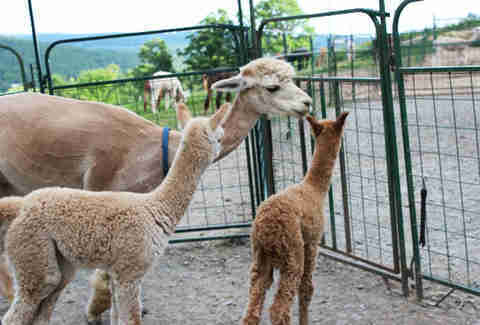 You can go visit these farms, take a tour, and even buy your own alpaca. This is not recommended for city dwellers, as an alpaca almost certainly violates the terms of your lease. A cool alpaca-wool blanket won’t though. Been on a lucky streak lately? Stop by the casino in Monticello, NY. With over 1,000 slot machines and games like blackjack and roulette, a stop at Monticello Casino could help fund the rest of your Catskills trip. If you prefer old-timey gambling, check out the Monticello racetrack, with horse races every Monday through Thursday. Break out the mint juleps! Zoom Flume Water Park is filled with steep-dropping waterslides, wave pools, ziplines, and tubes. Plus, they have the ultimate form of summer relaxation -- the lazy river. You too can float endlessly on a river, without a care in the world other than when to reapply sunscreen. Does it even count as touring the countryside if you don’t pick up some of the local hooch? In the Catskills, there’s a variety of different types of fermentation occurring. 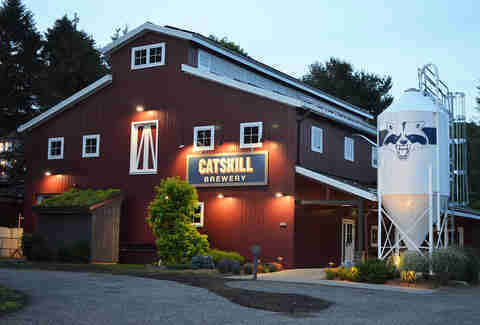 Be sure to check out the appropriately named Catskill Brewery, which is open to the public for “Growler Hours” all week except on Tuesdays. Check out the full range of brews, like the Devil’s Path, an IPA named after the most treacherous Catskills trail, or the small-batch Darbee’s Irresistible, a pale ale you’ll want to sip while supplies last. Seeking enlightenment that your local SoulCycle can’t deliver? 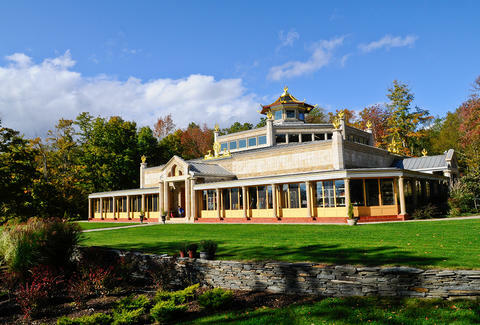 Get spiritual healing the old-fashioned way at the Kadampa Meditation Center, a Buddhist temple nestled on 82 acres of nature trails and scenery. You can go to take a course on meditation, or even spend the weekend at one of their retreats. Shaving your head is not required. After all that peace and love, get some aggression out with some good ol' fashioned paintball. For just $35, you get to play all day on the field of your choice (there are seven awesome ones so choose wisely). Then, like a live-action cosplay of everyone’s favorite war movie, you’ll get to hop on the back of a military truck and fire away at your friends. Paintball also has the added bonus of teaching you which friends will be most useful if zombies ever attack. Pack drinks and lunch or purchase it there; you’ll need plenty of sustenance to survive this paintball apocalypse.